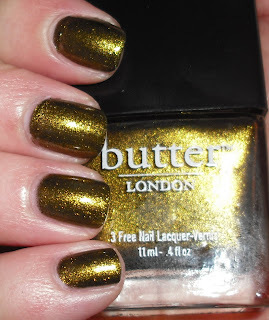 I'm sure you're wondering why I'm reviewing Butter London again, since I pretty much wrote them off after Big Smoke. On my birthday, I was at Nordstrom, and I saw the Butter London display, and that is when I saw Wallis. This color was stunning, and I couldn't pass it up! Wallis is a olive-gold shimmer-foil. This is stunning! The shimmer in this is beautiful. This color is very rich, and I found the formula on this good. Butter London has definitely revived themselves with this shade. I'm going to throw it out there, this is a must have. This is similar to Chanel Peridot in that is a yellow-gold, but the shimmer in this is much more compact and there is no multi-chrome. Plus, this is darker and richer. That being said, I prefer Wallis, hands down. That is sooo pretty! Love it! I don't own any Butter London polishes; no place near me sells it and I hate paying shipping to order things online. :( But this is gorgeous. I finally bought this today! I just had to after debating it and now I'm glad I did after seeing your post! I need to go get a washcloth to wipe up my drool. This is GORGEOUS. I don't own any BLs but lately they've been tempting me. This is much more my style than Peridot, I have to say. I love this on you! Wallis looks beautiful on you! I picked it up recently too and I'm excited to wear it. I was debating between Peridot, which is my birthstone, and Wallis, which is my niece's name. I decided on Wallis because my niece is very special to me and the less expensive price tag didn't hurt either. After seeing swatches of both, I'm glad I chose Wallis. I think it looks richer than Peridot. I have Butter London's British Racing Green and I love that one as well. It applies beautifully. When I bought Wallis at Nordstrom, they were having a buy 2 BL, get Yummy Mummy free. The sales lady was nice enough to throw in Yummy Mummy even though I only bought Wallis. I have Yummy Mummy on now and it applied like a dream as well. Don't discount Butter London based on Big Smoke. Give it another try. yeah, it looks so rich and colorful! I love it!